Having completed further training in the UK, Clare has returned to Senegal where she is working alongside literacy projects in various local languages. For an update read: Clare's Newsletter. The Board of Mission Overseas (BMO) administers the overseas mission work of the Church. Since mission has always been regarded as an integral part of the Church's life, the Board draws together representatives from the Presbyteries, Education, Youth, Inter-Church Relations and the PWA in order to inform and involve as many people as possible in this important work. Click on the logo above to go to the Presbyterian Mission Overseas website. The purpose of the Board of Mission in Ireland is Serving the Church; Enabling Mission. Our vision is that increasingly, Presbyterian congregations, north and south will become vibrant communities of Christ, serving and transforming Ireland. Click on the logo above to go to the Presbyterian Board of Mission in Ireland website. 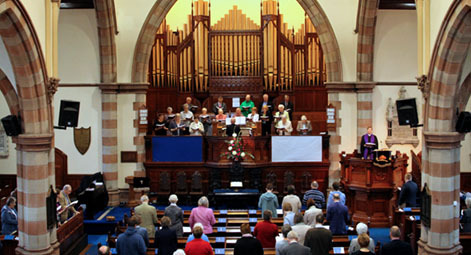 The United Appeal Board is responsible for raising much of the money that pays for the wider ministry of our church in Ireland and beyond, involving what we do individually in our congregations and corporately as a whole Church. Through donations United Appeal funds a wide range of church projects including evangelism, youth ministry, home and overseas mission, training of ministers and Sunday School teachers, communications and social witness. As a church with a vision for supporting those throughout the world in need we support the work of Christian Aid and its aims year by year. Click here for more information on Christian Aid. At Newtownbreda we support the Fairtrade organisation. Click here for more information on Fairtrade. Email address protected by Java-Script. Please enable Java-Script to contact me.